Today in our ABCs of Walt Disney World, we talk about just about everyone’s favorite subject…FOOD! When it comes to food around WDW, it’s everywhere! There are two primary categories of restaurant choices when in the World. You can choose from Counter/Quick Service locations or Sit-Down Restaurants. There are also what’s called Signature locations. These places boast some of the best menus, and some of the most expensive meals, on the property. Personally, it’s out of my budget, but if you can afford to take on this experience, go for it! If you’re in a hurry, counter locations are typically quicker to grab a meal and take the least amount of time out of your park time. Most quick service have basic menus. Hamburgers, hot dogs, fries, drinks. There are some, however, that serve more adventurous fair. In the Magic Kingdom, Cosmic Rays offers some of the best fried chicken on property is served here. And, there’s a nice sized indoor sitting area, so getting a break from the weather can help refresh your crew for the next round of attractions. If your at EPCOT, you might want to try something like Restaurant Marrakesh in Morocco. Unique flavors and atmosphere makes this experience worthwhile. There are many more in all the parks and something for every taste. Now if you want something that takes a bit more time and introduces you to some more exciting meals, then the vast array of Sit-Down Venues offer quite a variety! World Showcase alone has a virtual smorgasbord. Each country has an offering the tempt all palettes! Add to that the various resorts, Downtown Disney, and all the parks and you could spend a few months just trying to taste something from each. And, don’t forget the character meals! They are all over the place! One of our favorites in EPCOT is Nine Dragons in the China Pavilion. Quiet, tasty, and very good service! Yachtsmen Steak at Disney’s Yacht Club Resort is rumored to have some of the best meat dishes around Orlando. And, of course, ‘Ohana is possibly the hardest reservation to get! 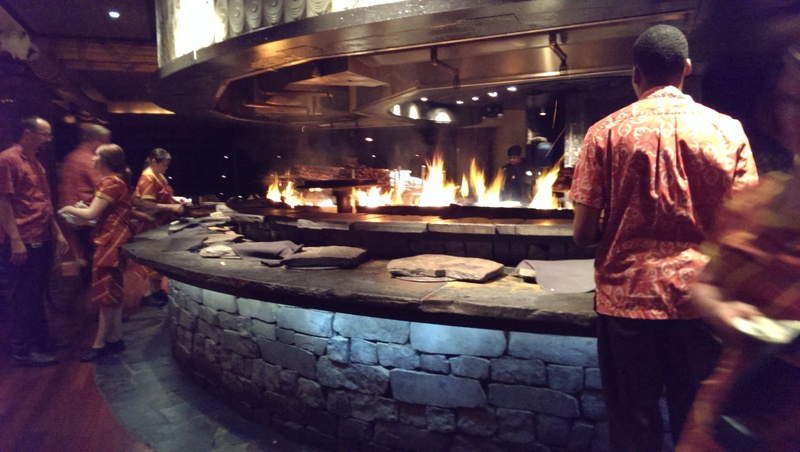 The Polynesian style cooking makes each meal delectable. Plan early for this one!! If you want to treat your beloved to a very special evening, then you may want to consider one of the Signature locations. One I want to try is The California Grill at the top of the Contemporary Resort! This restaurant has just undergone a refurbishment that includes some of the menu items. It’s going to cost you, but there is one thing that could make it worth every penny…The View!! From the balcony of The California Grill you can see, and hear, Wishes! from The Magic Kingdom. This will impress your special someone! There are many more offerings we could talk about, but that would take pages! Take a look at the Disney Food Blog website at http://www.disneyfoodblog.com/the-best-restaurants-series/ for more information and reviews.